Stephanie Meadow in action. 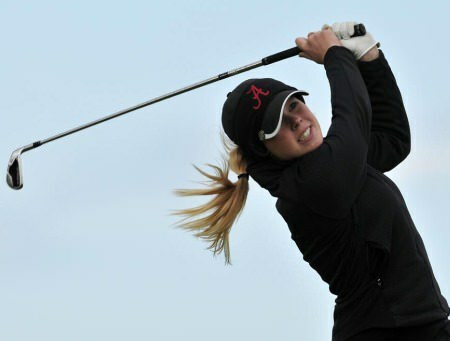 Stephanie Meadow is now sixth in the World Amateur Golf Ranking following yet another win on the college circuit for the University of Alabama. But things are also looking up for her former amateur team mate Danielle McVeigh, who opened with a one under 71 in the LET Access Tour’s Kristianstad Åhus Ladies PGA Open in Sweden. The Co Down player is tied for fourth, three shots behind amateur Patricia Sanz Barrio os Spain in the Ladies European Tour’s equivalent of the Challenge Tour where she is 22nd in the money list with two cuts made from three starts. 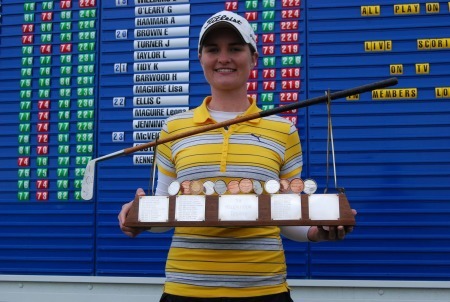 Tara Delaney opened with an 80 in Sweden as she seeks her first play cheque of the year. As for Meadow, the Curtis Cup star notched her seventh college win with victory in the NCAA D1 East Regional Championship over the Auburn University Club in Auburn, Alabama last week. Scores of 68, 66 and 69 gave Meadow a 13-under-par 54-hole total of 203 to tie the Alabama record for 54-hole scoring. It helped her to a six-stroke win over Kelly Shon of Princeton University. It was Meadow’s second East Regional victory following the 2011 Championship, and her second straight college win. The Jordanstown, Northern Ireland native has now won seven tournaments in three years of college golf. Meadow moves up one spot inside to sixth in the World Amateur Golf Ranking. Stephanie Meadow. Picture via ILGU.ieStephanie Meadow is heading for the US Women’s Open following her victory in the Ladies British Amateur Open at Carnoustie. 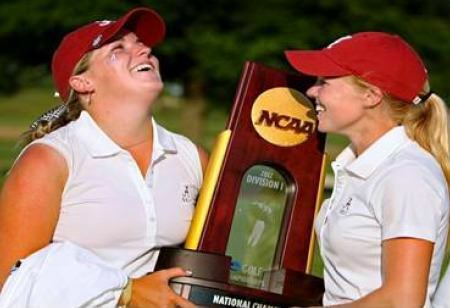 Stephanie Meadow (right) with team mate Tracy Wilcox at the NCAA Championship. Women’s golf doesn’t often get the credit it deserves but Ireland has every reason to be confident about the future of three Ulster stars. Stephanie Meadow is preparing for her senior year at the University of Alamaba and a probable move into the professional ranks in 2014. Picture © Pat Cashman/ILGU.ieIrish women’s golf has been blessed with some outstanding talents over the years – May Hewlett, Philomena Garvey, Lillian Behan, the irrepressible Mary McKenna. The list goes on and on. Ulster golfers Gareth Lappin and Stephanie Meadow are showing form on the US collegiate circuit.